In fact, the word CIVILTÀ is essentially untranslatable - including in English almost everything from "civilization" to "culture" to "ethos" to "way of life". Luxor on the Tiber? Or Rome on the Nile? Mussolini's Museum offers an imposing blend of Roman grandeur and Egyptian permanence and it figured prominently in plans for the (failed) 1942 World's Fair in Rome - marking the twentieth anniversary of the Fascist Revolution. Due to the vicissitudes of war and the collapse of Mussolini's Regime, the Museum did not open to the public until 1955 - ten years after the Duce's death. Proclaiming its message of Romanità (Romanness) to a different Italy in a different world. Augustus Caesar under lock and key. The Museum of Roman Civilization had a long and ideologically fraught gestation. Its most immediate ancestor was the 1937 Mostra Augustea della Romanità (Augustan Exhibition of Romanness). Augustus Caesar presided over the early formation of the ancient Roman Empire. 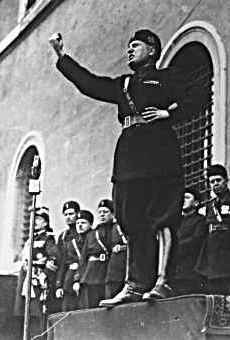 So, Mussolini expropriated him as his historical alter ego. What is it like today, visiting the Museum of Roman Civilization - now that Mussolini is long dead and Augustus merely one of the exhibits? Two clusters of objects from the Museum of Roman Civilization. The Museum is an immense walk-in encyclopedia - a thematic succession of fifty-nine vast rooms (most of the ceilings are over thirty feet high). Each is filled with casts, copies, diagrams and reconstructions, illustrating various aspects of Roman "civilization". Rome at the time of Constantine: at the scale of 1:250. The most celebrated exhibit - then and now - was a huge model of ancient Rome (measuring some 700 square feet). Like the rest of the Museum, it was intensely researched and gravely serious in intent. But it also offers endless scope for escapist fantasy - for visitors in our day and probably the Duce in his. We can lose ourselves for hours, wandering through the miniaturized intricacies of the Eternal City. Imagining ourselves on the ground - immersed in the full glory of its "civilization". Six views of the Museo della Civilità Romana © Lyle Goldberg And other historical material from the Web. Excellent ~ I so want to visit Italy, and this "quaint" museum. Actually, I would probably lose myself for hours in the miniature ancient Rome ~ that sort of thing fascinates me. It would be curious to see Mussolini's reaction over what had become of his self-aggrandizing monument. This is the sort of Chinese Mirror Box museum that I love most, with history within history within history. And it is also the sort of museum where we find yourselves floating from object to object to object...and then we snap out of it hours later and wonder where we are and where the afternoon has gone! 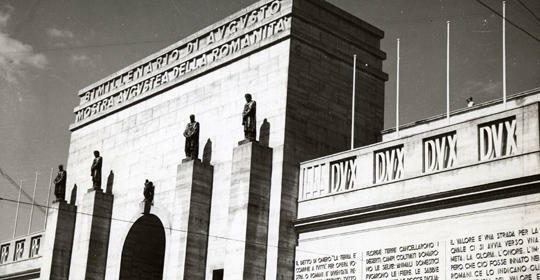 The Museum of Roman Civilization did not open until 1955, ten years after the Duce's death. But if he saw it, I imagine that he would have been delighted - since his personality and (heaven help us!) "vision" is still all over it, even if his name isn't. I think the last time I was in a really good history museum was when I was in Spain....sad to say. OK...I have added to my "bucket list" the Museum of Roman Civilization. I love how you worded a museum "with history, within history, within history." I had to think about that for a minute, but I fully agree ~ and in Europe I always felt like the architecture and musuems contained so many layers of history...it was overwhelming at times. I have been in love with that model of Rome since I was a little kid. If I were rich and eccentric instead of just eccentric, I'd have one built in my house and populate it with wee scale people. 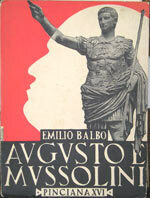 Was Emilio Balbo, author of the no doubt riveting "Augusto e Mussolini" related to Italo, by any chance? There are various publications by Emilio Balbo,from the late 1920s until circa 1940--all representing more or less the same school of thought. I imagine that these are all in the Biblioteca Nazionale here in Florence. It is hard to imagine that Emilio was not at least a kissing cousin of Italo (flying ace, fascist thug and eventual Ras of Libya), but that little chapter of Italian history remains to be written. Italo Balbo remains a major pin-up boy for the Italian far right. Mussolini counted wrong... His commemoration of Augustus' birthtook place a year early! Thank you for the historical adjustment. If only that were the worst failing of which we could accuse MB!